Practical hiking guide to the AV1 and AV2 trails, the most popular of the long-distance walks in the Italian Dolomites. 51 walking maps with unique mapping features - walking times, directions, tricky junctions, places to stay and eat, points of interest: Alta Via 1 - Lago di Braies to Belluno (9-13 days). Alta Via 2 - Bressanone to Feltre (10-16 days). Plus - short treks (1-5 days). Practical information - planning your trip and getting to the Dolomites. Historical and cultural background with a comprehensive section on the legends and culture of the indigenous Ladin people. 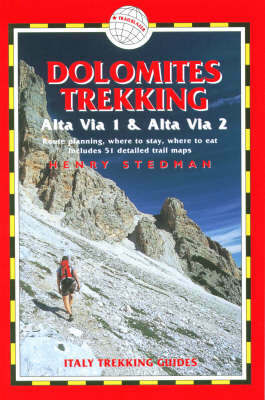 Includes guides to Cortina d'Ampezzo, Dobbiaco, Belluno, Bressanone and Feltre - detailed street plans, where to stay, where to eat, what to see, and getting to the start of your trek. Italian language section. Flora and fauna - full colour guide to the flowers of the Dolomites.